Lending Club Returns Increase To 12.22%. Lending Club Exceeds $1 Billion In Loans! By Peter Anderson 5 Comments - The content of this website often contains affiliate links and I may be compensated if you buy through those links (at no cost to you!). Learn more about how we make money. Last edited November 7, 2012 . Lending Club has been around for about 5 years now, and in that time it has grown from a small startup to become the next big thing. It has become, in my opinion, a legitimate option for people looking to add new investments to their portfolio, and the fact that they've had 21 consecutive quarters with positive platform returns shows that they're here to stay. On November 5th, 2012 Lending Club hit a huge milestone when they surpassed the $1 billion dollars in personal loans given to borrowers. That's a lot of money! Not only that but Lending Club has now paid out over $85 million dollars in interest to investors. San Francisco-based Lending Club has experienced tremendous growth since it began in 2007, with facilitated loan volumes doubling each year and on pace to triple in 2012. With $82 million in personal loans facilitated in the month of October, Lending Club is also on a $1 billion annual run rate. Lending Club reduces the cost of traditional banking to offer borrowers better rates and investors better returns. The platform's growth has been largely fueled by borrowers looking for lower rates. More than 72 percent of borrowers on the platform report using their personal loans to pay off existing credit card balances. By focusing on high-credit-quality borrowers, Lending Club's platform has also generated 21 consecutive quarters of positive returns. So Lending Club has been a win for just about everyone so far. Borrowers get lower rates than they may have been able to get at a traditional bank, and investors get returns on their money that they probably wouldn't have seen in the stock market over the past few years. A few months ago I saw my Lending Club returns top 12% for the first time. Since then my returns haven't dipped below that number, but they have had a bit of up and down. This month they're back up to 12.22%, the highest it's ever been! Since I topped 12% I've seen several loans go late, and had at least one more of them get charged off. Of the loans that are late, several of them are later in the loan, so don't have nearly as much to pay off as some of the others (good for me!). One of the late loans just updated, and apparently the borrower was just found to be deceased. That's the first time I've had that happen, and I'm assuming that the loan may get charged off as well. Sad. We'll see what happens with that one. Net Annualized Return of 12.22%: My last few Lending Club reports have showed increasing returns with my Lending Club account. The last year has seen it rise from 10.53% (still not too bad) all the way up to 12.22% this year. During that time I've added some higher interest loans, and seen a few more loans go late, but I'm still impressed with the results. Thirty seven loans have been paid off early: Twelve were A grade loans, ten were grade B loans, nine were C grade, one grade D, three grade E and two F. Looks like grade A and B loans are more likely to get paid back early, reducing returns. The earlier a loan is paid off, the less likely you are to be making money, and in some cases you may actually lose money! Another reason to consider investing in lower grade loans. 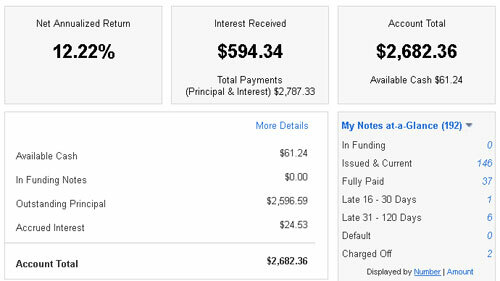 I’m diversified by investing small amounts across multiple loans: I've had 192 loans since joining (146 issued and current loans, 37 paid off), with no more than $25 in each loan. In other words, I'm diversified across a decent amount of loans, lessening my risk from any one loan going into default or getting charged off. Of course to be fully diversified I believe Lending Club recommends 800 or more notes. I'm not there yet, and won't be until later when we've finished saving up a down payment for a home. NOTE: Over 98.9% of all investors with 100 or more Notes have experienced positive returns. 100 Notes can be purchased with a minimum investment of $2,500. When you're looking at the numbers on the Lending Club and Prosper sites, it has been pointed out time and again that their numbers are overly rosy view of what your actual return on investment will be. The ways that they calculate the ROI isn't really standardized, and they don't take into account how old your loans are, possible future default rates, or other things that may become a factor. The numbers they show are just something you have to take or leave. Nickel Steamroller's Lending Club portfolio analyzer does a better job of giving you an idea of your actual ROI. Basically the analysis tool with give you an estimated ROI after you download all your notes from your Lending Club account and upload the .csv file. It will go through you notes and give sell recommendations, show duplicate notes and highlight notes that are below Lending Club’s average return (so you can sell them on the secondary platform). It will even give you a fun little map showing where your loans are (see mine above). In looking at my returns on the analyzer, my actual return according to the site will be closer to 10.45%. It also gives me quite a few sell recommendations, particularly on some of my older lower interest loans that I did when first starting out. Those particular loans tend to be grade A or B, and have interest below 8%. I'm sticking with some of them for now, but down the road I may lean more towards the lower grade loans in my portfolio. Here's the basic strategy I've been using with Lending Club since I started investing. The strategy has changed a little bit over time to include more low grade loans and a few loans with higher balances. Last Edited: 7th November 2012 The content of biblemoneymatters.com is for general information purposes only and does not constitute professional advice. Visitors to biblemoneymatters.com should not act upon the content or information without first seeking appropriate professional advice. In accordance with the latest FTC guidelines, we declare that we have a financial relationship with every company mentioned on this site. Congrats Peter, you are doing very well. The only thing I would add to your article is that in Lending Club’s press release from Monday they also announced that they are now cash flow positive. What this really means is that Lending Club is becoming a lower risk investment all the time. Oh, that’s right. I forgot to mention that fact. I saw that in the news as well, being cash flow positive is great news too! It just further underlines the fact that they are a stable, solid investment. I can’t argue with the returns, but what is the Biblical or moral perspective of charing such high interest rates? The high returns are due to the high interest rates and to me appear like usury. I for one couldn’t live with the thought of charging anyone I know that much interest (6%-24%). Am I missing something? Typically the rates people are getting with Lending Club are going to be lower than they can get with a bank, and I do my best to ensure that the loan is going for things and for situations in which it’ll be a blessing and not an added burden. Here’s a great discussion of the topic of Christians and lending that speaks to my own feelings on the topic. Good to hear you’re lending isn’t set on auto-pilot. I’m interested to read your link.